Your mental picture of a slingshot might be a wooden “Y” with a rubber band attached, the sort hanging out of Tom Sawyer’s back pocket. Modern slingshots, however, can be a far cry from that image, a small but surging Candler company is proving. Nathan Masters, founder of SimpleShot Shooting Sports, is an emerging master of 21st century sling gear. He has the Great Recession to thank: Masters was working in real estate when the market crashed, so he turned increasing attention to what was then a hobby—making and shooting slingshots. Exploring online, he found a vibrant community of sling fans, so he launched a line of custom slingshots—initially called FlippinOut—to feed their interests. In 2012, he rebranded as SimpleShot, and the company now makes and sells dozens of models (of Masters’ design and those of several other specialists) along with slingshot accessories. The company is “devoted to bringing the art of slingshot shooting to everyone,” according to its website, and Masters and his two employees have models to suit a wide range of slingers. The Custom Lil’ Plinker, a model with exquisite woodwork, sells for $300, while other high-end models are made from various metals or virtually indestructible polyethylene or metal. Many models, though, are in the $20 to $25 range. 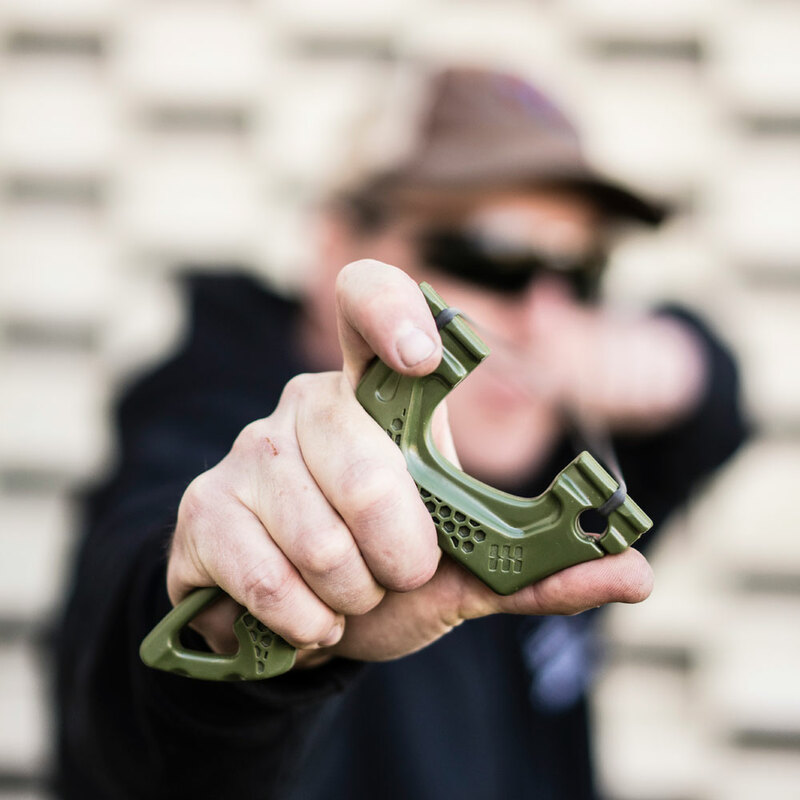 SimpleShot recently debuted The Hammer—a slingshot/slingbow, which Masters believes is a revolutionary advancement. With a retail price of $130, “It will appeal to those guys who had erector sets or other building sets when they were young,” he says. The Hammer has a wrist brace that can be taken off and an exchangeable head that allows it to shoot arrows. He also hopes The Hammer and future innovations will help transform his company from a bootstrap venture to one that allows him a bit more time with his wife, a teacher, and his two young sons. He’d be able to venture out more with his boys, fly-fishing, and yes, shooting slingshots.